December was a whirlwind month for the Bruins. The month had its ups and downs, with more of the latter than the former. A few come from behind victories against the Minnesota Wild and Buffalo Sabres were exciting and showed the teams will to win. 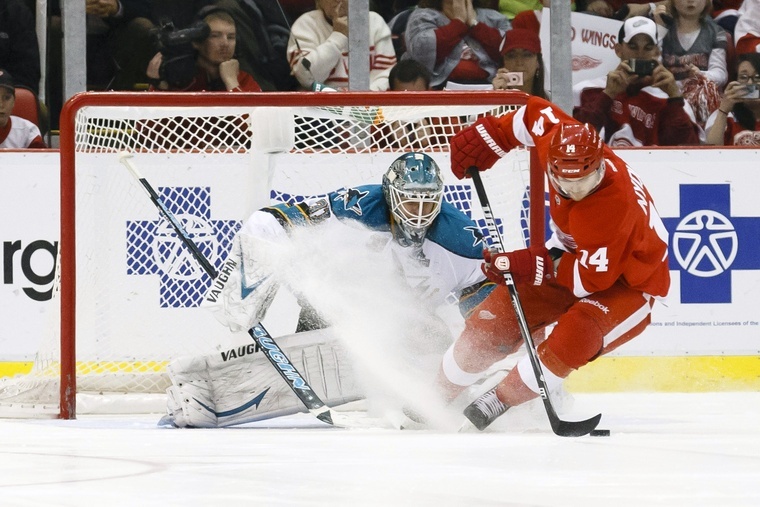 Defeats to the San Jose Sharks and Columbus Blue Jackets put the teams’ frustrations into the spotlight, as they were overmatched and outwilled in the those games. It all began when the Bruins went out West for their road trip. That’s where the mayhem started. Facing Western Conference powerhouses, Boston dropped games to the Anaheim Ducks, Los Angeles Kings, and got throttled in San Jose versus the Sharks. After a solid performance in Phoenix, playing a great game in a win against the Arizona Coyotes, many believed that the Bruins could turn their disappointing start to the month around. Carl Soderberg’s offensive campaign has been impressive, but he can’t do it alone (Winslow Townson-USA TODAY Sports). A series of three straight losses (albeit the last two were shootout losses), all by a score of three to two, soured the attitude on the team and had fans crying for a shakeup to the personnel. To cap off the three game roadtrip after splitting the Nashville and Minnesota games, Boston lost a 2-1 in Winnipeg. Goaltender Michael Hutchinson stepped up to make 16 key third period stops to secure the Jets’ 2-1 victory, and trade speculation about a acquiring a forward grew louder. Loui Eriksson scored his second overtime game winning goal of the month to beat Buffalo, and Brad Marchand and the offense exploded to topple Nashville at home right before the Christmas break. As the team headed into the Christmas break, it appeared as if the corner might have been turned. Loui Eriksson has been the Bruins’ crutch in overtime, scoring goals when they needed him most (Kevin Hoffman-USA TODAY Sports). The Bruins got blasted by the Blue Jackets, and the overall effort was head-scratching. Niklas Svedberg was pulled in the early second period after allowing three goals on 15 shots, and headline from the game might have been Milan Lucic fighting Dalton Prout after Prout “sucker punched” Lucic in their last bout. After a disappointing game in Columbus, the Bruins have a chance to usher out 2014 with two critical wins over divisional opponents. Home games against the Detroit Red Wings and Toronto Maple Leafs are must win games. The Bruins look up at both teams in the standings, so gaining ground on them is obviously important. Momentum entering the new calendar year is equally important, as the Bruins need to hit the reset button and put the ghosts of this season behind them. This team has a proven track record of mentally tough and talented players who know how to win. Once they catch fire, the Bruins will be a very tough team to defeat. Gustav Nyquist has been a revelation for the Red Wings, adding to their offensive firepower (Rick Osentoski-USA TODAY Sports). Two consecutive losses to “rivals” (NBC Sports Network thinks everyone is a rival) and three in a row at the hands of conference opponents would definitely hurt. It wouldn’t be the iceberg to the titanic; however, the Bruins couldn’t afford to lose their confidence. When on top of their game, the Bruins play with swagger. They execute their gameplan, and want to jam it down the opponent’s throat. No matter what opponents throw their way, the Bruins stick to their guns and play their game. With confidence comes chemistry, and pinpoint passing and more precision in the offensive zone. The bottom line is that the Bruins can morph into their previous self, and get away from being the ugly twin who can’t seem to find their morale. Beating these Original Six rivals won’t be easy: both the Red Wings and Maple Leafs are no cakewalks. The Maple Leafs lead the league in goals scored, and the Red Wings have plenty of offensive firepower on their side. While both games will be hard-fought battles, if the Bruins can win both, they will start the New Year on a good foot. Can the Bruins turn the ship around? Will they beat Toronto and Detroit? What happens if they don’t? Comment below with your take.